NASA was mostly shut down for January 2019, but Earth wasn’t. In case you missed it, here are some of the big stories we didn’t cover during the impasse. Four billion years ago, the Moon was about three times closer to Earth than it is now. So if a large asteroid or comet slammed into Earth and jettisoned material into space, it was more likely that rock fragments might end up landing on the Moon. That’s how an international team of scientists working with the Center for Lunar Science and Exploration (CLSE) think that a small fragment composed of quartz, feldspar, and zircon—a combination of minerals commonly found on Earth—ended up embedded within a larger Moon rock collected by Apollo astronauts. The team recently revealed evidence from the ancient rock fragment, suggesting that it is one of the oldest Earth rocks ever found. It is rare for powerful tropical storms to strike Thailand. Before January 2019, the last time it happened was 1962. 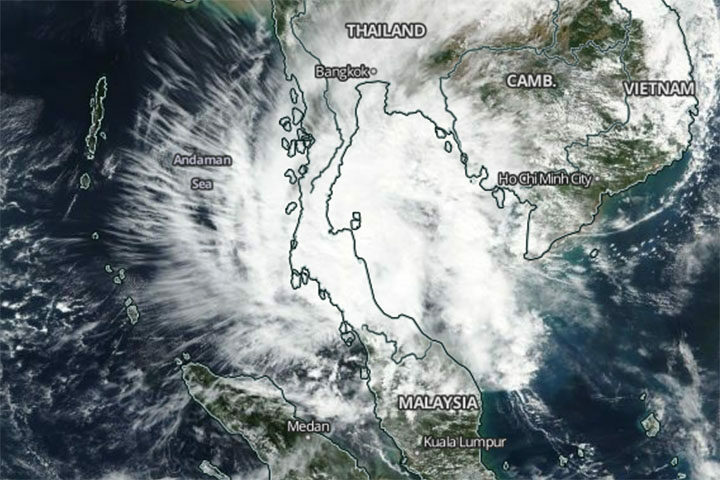 So meteorologists took notice when Tropical Storm Pabuk slammed into southern Thailand on January 4, 2019, packing sustained winds of 95 kilometers per hour (60 mph) and delivering torrential rains to some of Thailand’s most popular tourist destinations. The Moderate Resolution Imaging Spectroradiometer (MODIS) on NASA’s Aqua satellite captured this image of the storm on January 4, 2019. In another unusual weather event, fresh snow created surreal scenery in Algeria when it coated Saharan desert dunes in mid-January. This is just the third time snow has fallen in Ain Sefra, the gateway to the Sahara Desert, in the past 37 years. (The last time was 2018.) 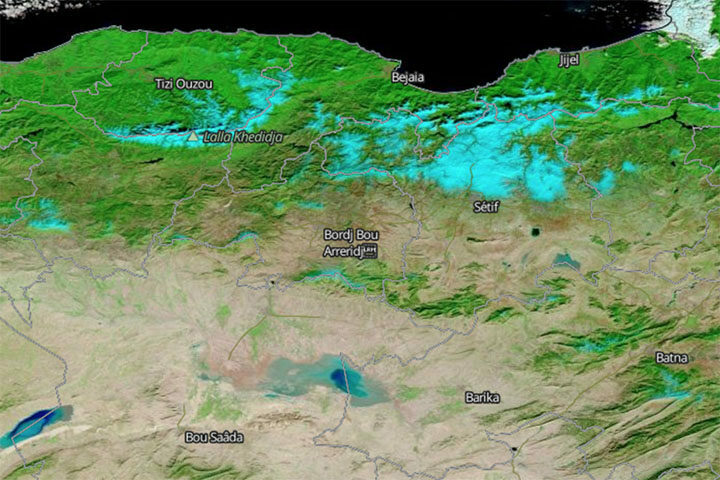 The Moderate Resolution Imaging Spectroradiometer (MODIS) on NASA’s Terra satellite captured an image of the snow on January 14, 2019. It is composed with false color, using a combination of infraed and visible light (MODIS bands 7-2-1). Snow appears blue with this band combination. For the past few years, China has advanced an ambitious plan to reduce emissions of fine particulate (PM2.5), a harmful type of air pollution. Authorities have restricted the number of vehicles on the roads, capped how much coal industries can burn, and shuttered many polluting factories and power plants. 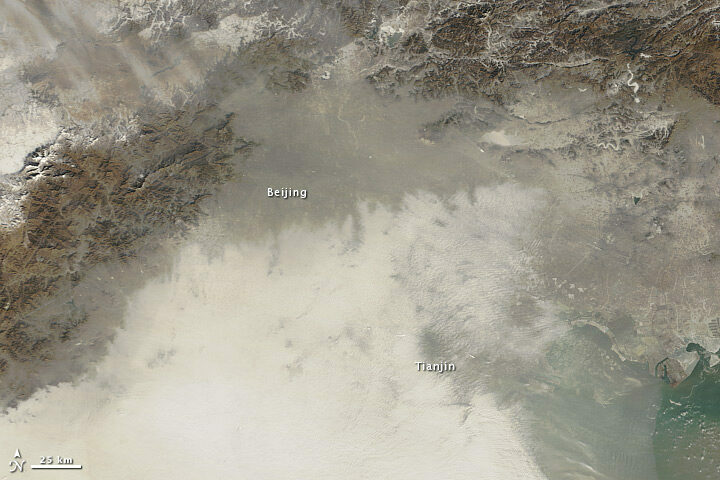 The result has been impressive: over five years, concentrations of PM2.5 in eastern China have fallen nearly 40 percent. But, there is another wrinkle. Particulates also sponge up substances that make it harder for ground-level ozone to form. So even as concentrations of PM2.5 decline, ozone concentrations are rising, new research shows. Increasingly, yes, at least in rural areas. By analyzing observations of villages in Kenya, one team of researchers recently showed that land use and land cover data from satellites contains some useful clues for identifying the poorest households in rural areas. Key indicators included: the size of buildings within a homestead, the amount of bare agricultural land adjacent to a homestead, and the length of the growing season. The researchers think this type of information could make it easier to monitor the progress of efforts designed to reduce poverty in rural areas, such as the U.N. Sustainable Development Goals. This entry was posted on Thursday, February 7th, 2019 at 1:07 pm and is filed under In Case You Missed It, News Roundup. You can follow any responses to this entry through the RSS 2.0 feed. You can skip to the end and leave a response. Pinging is currently not allowed.